Tired eyes, often referred to as Tear Troughs, are dark circles that are sometimes hollow in appearance that forms on the lower eyelids. 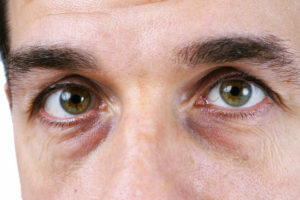 In extreme cases, tear troughs can be identified as permanent eye bags. This can make a person look tired or unwell. As the skin under the eye begins to thin, the muscle which is underneath become more prominent. Losing overall volume in this area is often a sign of ageing skin. The ageing process ensures that the skin loses its elasticity and that the eye socket recedes. Such changes can then see the tear trough move away from the face (pseudo-herniation of the infraorbital fat pads). Over time, bags will develop. This is an indication that the tissue is pushing the skin outwards. For some, tear troughs occur as a result of lifestyle choices such as smoking, not drinking enough water and not obtaining enough sleep. Such a lifestyle can cause laxity in the skin and premature ageing. The skin around the eye area is incredibly delicate and is, therefore, vulnerable to sun damage. For this reason, it is crucial that a person protects the eyes with dark glasses when in the sun. Tear troughs can form in both men and women. Dr Nick Milojevic is regarded as the “go to man” for this problem in the U.K., and wider Europe. He was one of the first doctors to start treating the year trough over 10 years ago and with his very own wow treatment technique, he has now performed over 8000 cases of non-surgical eye bag and tear trough treatments. Tatler magazine recognizes him as the best in his field every year and we continue to be number one on google generic listings for this condition.